The Capture The Magic Podcast is one of the fastest growing Disney podcasts about Walt Disney World rumors and news, park tips, reviews & more. On top of the latest Disney World rumors & news around the parks, we have discussions about the trip tips, rides, shows, food reviews, trip recaps, & more. Capture The Magic Podcast is a Disney World podcast where we discuss the best and latest Disney World news & rumors around the parks along with discussions about the best rides in the parks, food reviews, travel recaps, travel tips and more. We would love for you to join us by subscribing to the podcast and leaving us a review to let us know what you think. The Capture the Magic Podcast is essentially a radio show that delivers some of the best and most up to date news and information about Walt Disney World. The goal of the podcast is to do what the best Disney World podcasts do, which is to provide you with the latest Disney World updates and lively discussions that can help you in planning your future vacations. A lot of Disney World fans are drawn to the podcast episodes that have fun topics like Dis Talks, Love It/Hate It, and reviews of the best attractions, restaurants, and special Disney events. The podcast has become one of the best Disney World podcasts and having just launched in 2018 it has been growing rapidly since and continues to gain more listeners and subscribers every week. Our goal is to continue to grow our Disney World podcast network with great shows that both inform and entertain you, while also bringing you the latest information on planning and getting the most out of your trip. The Capture the Magic Podcast actually started with Capture the Magic Apparel in January 2017. We created the website to provide fellow Disney fans and vacationers with the best information we could about planning their next trip along with creating original Disney inspired t-shirts. The Capture the Magic Podcast was the next step we took in spreading our Disney fandom. I, Jamie, have always had Disney as a part of my life since I was a young child, so talking about all things involving Disney was something I was excited for, but just didn’t know how to execute. Enter my husband, Jared. Being a bit of a technology and marketing guru, Jared had the skills and background to set up and create a Disney World centered podcast. Even though he only became a Disney fan a few years ago, he is always up to date on the latest happenings in the parks, has become a Disney history buff, is a self proclaimed comic book geek and is always eager to talk about his knowledge about the parks and share his opinions of the business and technical side of Disney. We put out our first podcast episode in late June of 2017. Doing anything new can be quite nerve-wracking and we did not expect much of an audience when we started the podcast for a while. But we were blown away by how well it has been received! The podcast’s audience has grown with each month, which seems absolutely crazy to us. It’s very flattering to think that listeners of the podcast out there enjoy hearing us talk about Disney World and even want to connect with us. 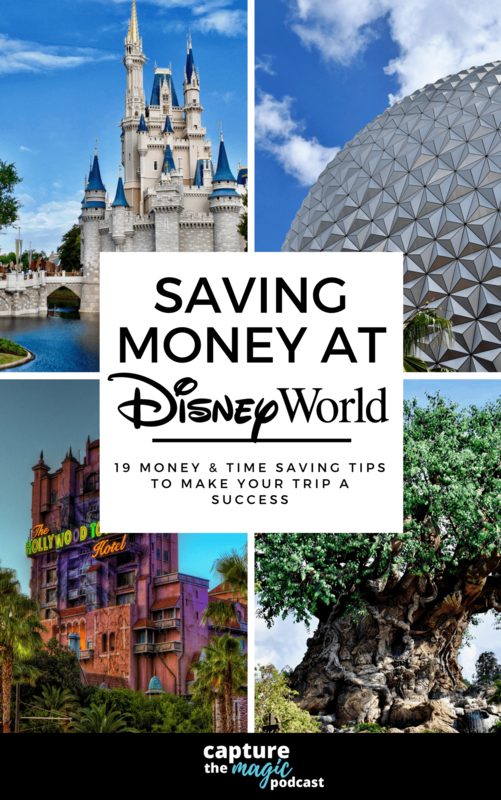 We feel very fortunate that we can bring any kind of joy, fun and/or information to the Disney World fan community and help people plan their Disney World vacations. We are currently producing two podcast episodes per week: a Disney World discussion topical episode on Mondays and a Disney World news and rumors episode on Thursdays. We have also launched The Dis Dudes Podcast and our all new Disney World Trip Reports podcast called Trip Tales as new shows on the Capture The Magic Podcast Network. The podcasts are also posted to YouTube on our Capture the Magic channel along with our vlogs that we have just started producing as well. So you can catch the show on YouTube, iTunes, Stitcher, Spotify, TuneIn Radio and Google Play to name a few. Each podcast episode is hosted by either Jared or myself, with the other person obviously joining them in that show’s discussions. Most of the topics and news stories on the podcast are about Disney World, with just a slight portion involving other parks, movies, TV shows and/or the Walt Disney Company in general Walt Disney. We can’t wait for what is to come for the future of our Disney World podcast. We plan to have other people on the show to participate in our conversations to bring more perspectives, even more, and vlogs on our YouTube channel. We are so excited to see what our podcast will become and to continue to grow it into one of the best Disney World podcasts out there today. We are also releasing new shirt designs and have new shows coming out frequently as we are building a podcast network that can be your one stop shop for all your Disney World vacation needs. We hope you’ll join us along for the ride. You can subscribe to the podcast below and you can always reach out to us by shooting us an email to [email protected].